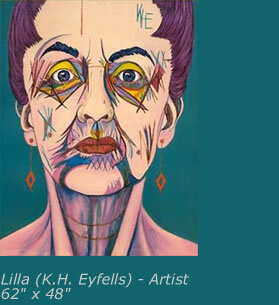 Halldorsdottir Eyfells' stylistic and imaginative approach to portraiture is resourceful and energetic. Thumbing through magazines she looks for memorable physiognomies, for the reality and unreality of appearance; she studies biographical and autobiographical materials. In the end, her lexicon of famed faces is derived from magazine photographs (hence, the flatness and hardness of her visages), biography, and her interpretation of the two. Of course, photography is a dynamic that others have used for the portait, ike Andy Warhol or contemporary artist Chuck Close. Unlike Warhol or Close, however, she does not personally know her subjects, yet they are known to her. Halldorsdotir Eyfels does not talk about her work, about the hows, the whys: "Painting is action, not words, not an object," she says. "How can people talk about something that can be expressed only by doing." The portrait in Western art is well-documented. It has been used to celebrate the subject's social and political status, marriage and family ties, and at times used to memorialize a subject posthumously. For Halldorsdottir Eyfells, her "characters" are a personal response to eminent members of society; for us, they are paintings by an artist spiritually and aesthetically endowed. If they lack the delicacy of poetry, they have the strength of prose. And to those looking at these "famous faces" with an open eye and a thinking heart, they demonstrate vitality and invention. And added to this, they show us a remarkable woman who is an artist first and foremost.